The story below is taken from the Acts of the Apostles and tells about St .Paul’s (Saul) conversion. It is very handy if you want to describe different religious experiences and how they might make you to start believing in a God. The story covers – Visions, Miracles and conversions all in one! 15The LORD said to Ananias, “Go! I have chosen him to tell foreigners, kings, and the people of Israel about me. 16I will show him how much he must suffer for worshiping in my name.”17Ananias left and went into the house where Saul was staying. Ananias placed his hands on him and said, “Saul, the LORD Jesus has sent me. He is the same one who appeared to you along the road. He wants you to be able to see and to be filled with the Holy Spirit.” 18Suddenly something like fish scales fell from Saul’s eyes, and he could see. He got up and was baptized. 19Then he ate and felt much better. 22Saul preached with such power that he completely confused the Jewish people in Damascus, as he tried to show them that Jesus is the Messiah. 23Later some of them made plans to kill Saul, 24but he found out about it. He learned that they were guarding the gates of the city day and night in order to kill him. 25Then one night his followers let him down over the city wall in a large basket. 1. 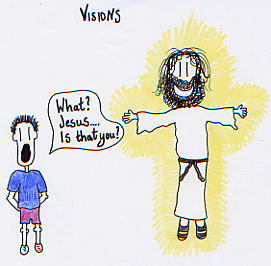 A Vision when Saul hears Jesus. 2. 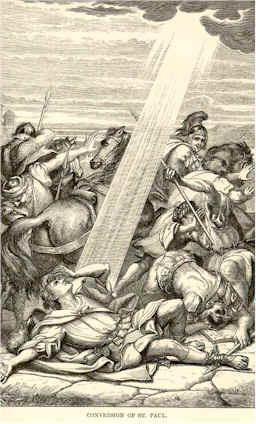 A Miracle when Saul is cured of his blindness. 3. When Saul converts from Judaism to Christianity due to his experiences.